We hope you will follow recommended maintenance schedules and let us know of any suspicious behavior of your vehicle before it is “dead-in-the-water.” But, should bad luck prevail, we have a contract with not the cheapest, but the best wrecker service we know of. In the Austin area the charge is usually $85.00. They bill us, we bill you. The charge will be itemized on your receipt and we will be happy to print an extra copy should you be able to get reimbursement from your insurance. 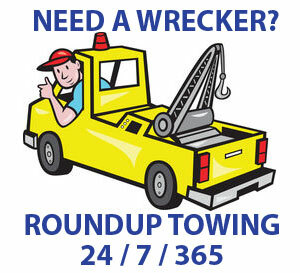 They are ROUNDUP TOWING, 512-280-2803, answered 24hr/day, 7days/week, 365 days/yr. They will know exactly what to do. Please be sure they have a key to your vehicle and please send a note or leave voicemail — better yet both — so when I go by the shop I will know what the car outside the gate is about. If at all possible, I will get it inside the gate asap even during the weekend. If your vehicle is doa at home please wait until business hours to have it towed in. The weekend is a long time when your vehicle suffers a crisis, so I respond to voice-mail messages — usually within a few hours — throughout the weekend to give whatever support and advice I can to my valued clients.